With the World Cup 2010 being held in South Africa, a tradition is made clear to the rest of the world: the vuvuzelas. A loud trumpet-like instrument, being controversial, for they have been associated with permanent noise-induced hearing loss. AbcNEWS has an interview with Trevor Cox, president of the UK Institute of Acoustics and an acoustic engineer at the University of Salford, UK, to explain their appeal – or otherwise. How do vuvuzelas make their sound? 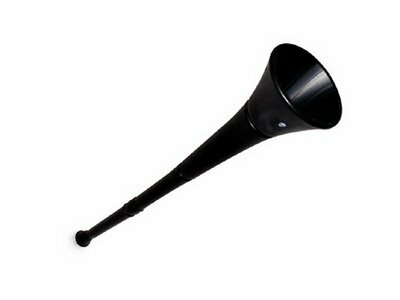 The vuvuzela is like a straightened trumpet and is played by blowing a raspberry into the mouthpiece. The player’s lips open and close about 235 times a second, sending puffs of air down the tube, which excite resonance of the air in the conical bore. A single vuvuzela played by a decent trumpeter is reminiscent of a hunting horn – but the sound is less pleasing when played by the average football fan, as the note is imperfect and fluctuates in frequency. It sounds more like an elephant trumpeting. This happens because the player does not keep the airflow and motion of the lips consistent. When hundreds of the vuvuzelas are played together, you get the distinctive droning sound. People in the crowd are blowing the instrument at different times and with slightly varying frequencies. The sound waxes and wanes. The overall effect is rather like the sound of a swarm of insects. The loudness can be explained by the bore shape, which is roughly conical, and flares. As well as creating sound at a frequency of 235 hertz, the instrument generates harmonics – sound at multiples of the fundamental frequency. We have measured strong harmonics at 470, 700, 940, 1171, 1400 and 1630 hertz. A flared instrument has louder higher-frequency harmonics than a cylindrical one. The flared instrument is perceived as louder because the higher harmonics are at frequencies where our hearing is most sensitive. This is partly why the conical saxophone sounds louder than the cylindrical clarinet. 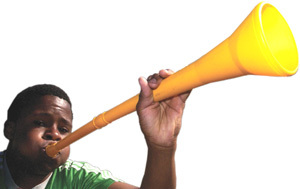 Since it produces 116 decibels at 1 metre, prolonged exposure to the vuvuzela poses a risk to hearing, according to a study by the Department of Communication Pathology at the University of Pretoria, South Africa. Listen to just one instrument for 7 to 22 seconds and you exceed typical permitted levels for noise at work. A whole crowd produces even higher levels, and measurements at a training match have shown temporary hearing loss among spectators. Experiments on other noise sources show that louder sounds are more annoying. Our hearing is an early-warning system: we listen out for sudden changes in the sounds around us which might indicate threats, and ignore benign, persistent noise. When noise becomes as loud as a vuvuzela, however, it becomes impossible to habituate to the sound. What else about the sound makes it annoying? The droning quality makes it more annoying – the fact it has a distinct pitch or note. Investigations into many noise annoyance problems have demonstrated this. Indeed some noise standards and regulations have corrections to allow for the additional annoyance from such sound. Droning sounds are harder to ignore and more alerting than broadband noise such as the hiss of a badly tuned radio. This might be because tones can carry useful information in the vowel sounds of speech. But it might also relate to threat detection – because predator sounds like a lion’s roar has tonal components – but I’m speculating. What can be done to make it less annoying, especially on TV and the radio? Broadcasters have to balance how much crowd sound to use compared to the commentators’ voices. If they make the crowd too quiet then the game lacks atmosphere, so they can’t turn it off altogether. If you are watching the match on a computer, you could try this, from the Centre for Digital Music at Queen Mary University of London. Otherwise, you might just have to try and accept the sound as being part of the background. Lack of control over a noise source has been shown to increase its perceived annoyance. So your best bet might be to crack open another beer and try your best to enjoy the atmosphere.